AACR-NCI-EORTC International Conference, Philadelphia · 2017, Marill J. et al. Background: Between 70 to 90% of patient have “cold” tumors, i.e. devoid or poorly infiltrated by immune cells, rendering inoperative their treatment by immune checkpoint inhibitors. To allow these patients to benefit from these therapies, it is fundamental to prime an antitumor immune response. Radiotherapy (RT) has demonstrated its ability to induce the immunogenic cell death (ICD), a crucial event allowing the priming of the antitumor immune response. Meanwhile, a new class of material with high electron density, hafnium oxide, was designed at the nanoscale (HfO2-NP) to efficiently absorb ionizing radiation and increase the radiation dose deposition from within the tumor cells and increase killing of cancer cells. Here, we compared the ability of HfO2-NP and RT to RT alone to kill cancer cells and induce immunogenic cell death. Results: For all the tested cell lines treated with HfO2-NP and RT, a marked increase of apoptosis and necrosis was demonstrated, compared to cells treated with RT alone. 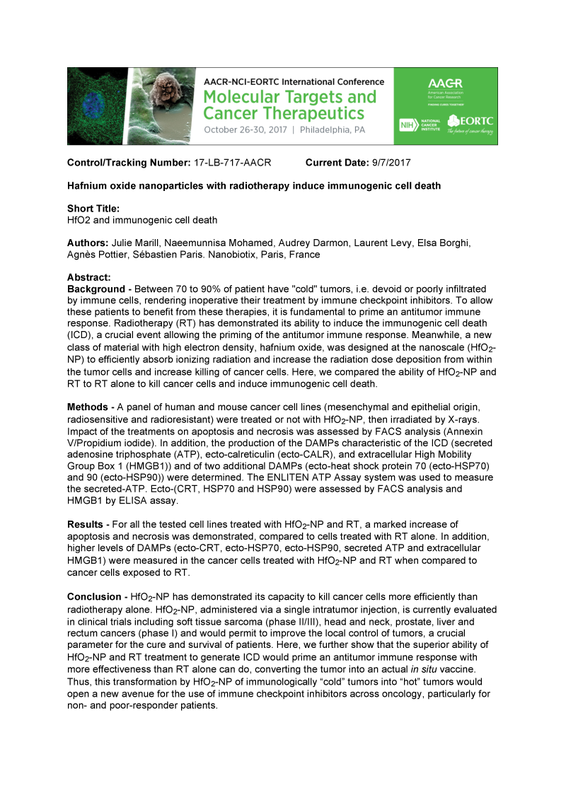 In addition, higher levels of DAMPs (ecto-CRT, ecto-HSP70, ecto-HSP90, secreted ATP and extracellular HMGB1) were measured in the cancer cells treated with HfO2-NP and RT when compared to cancer cells exposed to RT.